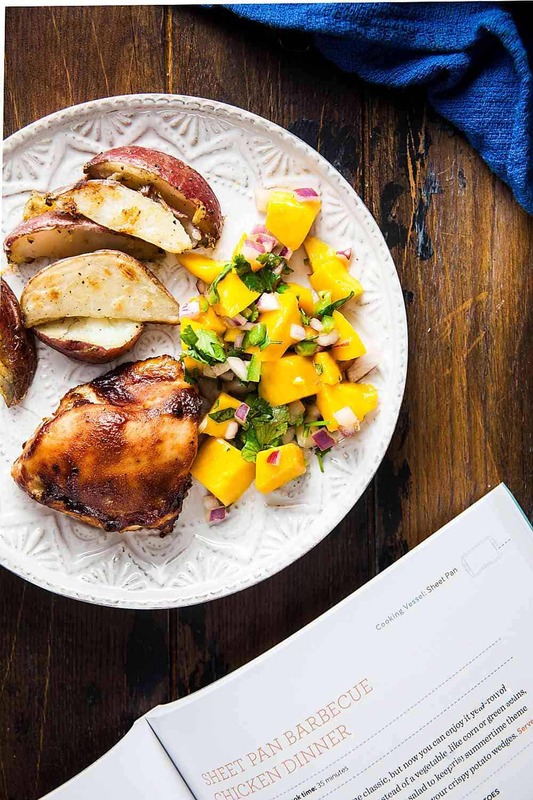 Sheet Pan BBQ Chicken with Mango Salad from Healthy Eating One-Pot Cookbook | Healthy. Delicious. 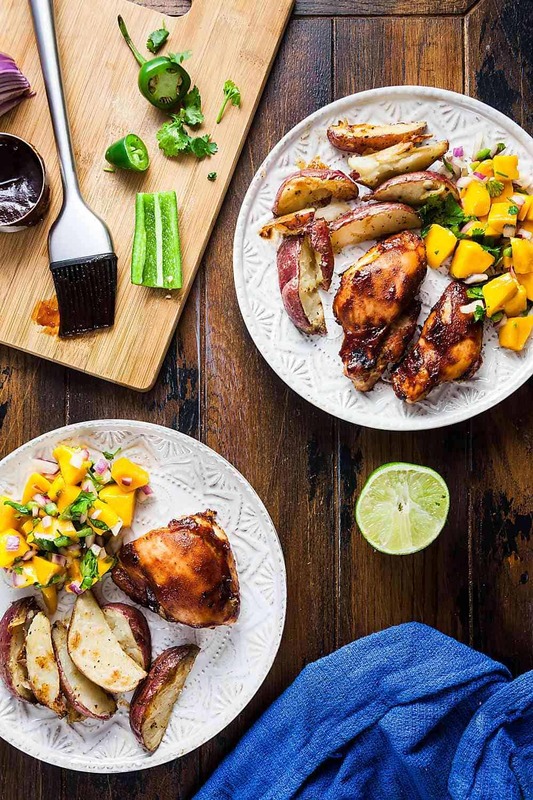 Barbecue chicken is a summertime classic, but now you can enjoy it year-round thanks to this easy sheet pan recipe. Instead of a vegetable, like corn or green beans, I like serving this chicken with spicy mango salad to keep the summertime theme going. Guys, MY HEALTHY EATING ONE-POT COOKBOOK COMES OUT IN ONE WEEK! And the Kindle version is already available for people to download. Somebody pinch me, please. On one hand, it feels like I started testing recipes for my book ages ago but, on the other hand, I can’t believe it’s coming out already! I can’t wait for you all to get your hands on this book – I know you’ll love it. I already have my copy and I’ve been using it nonstop myself. I did NOT feel like cooking dinner the other night after a long day at work, but knowing that I had this resource of healthy, easy (think 10 ingredients or less and made in one pot or pan for easy cleanup) recipes at my fingertips made it so much better. 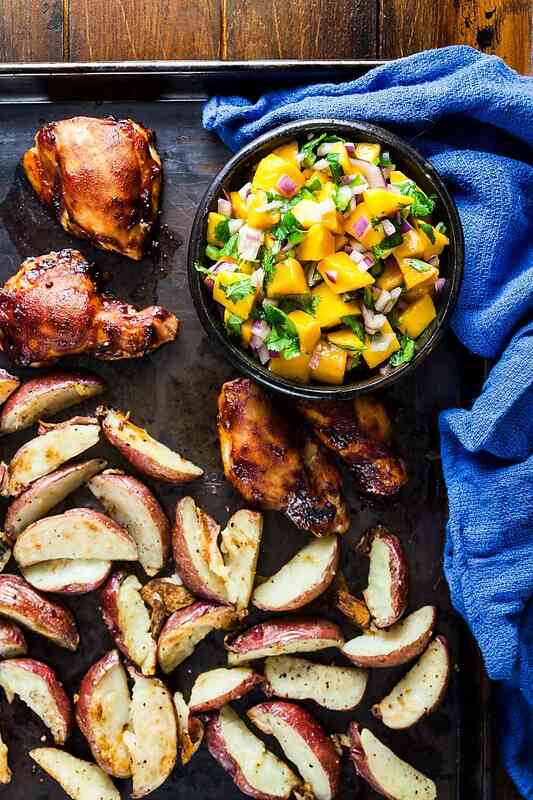 I made this barbecue chicken thighs with roasted potato wedges and mango salad in the time it would have taken to get a pizza delivered. Although if I did feel like pizza, my book has a great recipe for that too. You make it in the air fryer and it’s so delicious. This is probably the last sneak peek that I’ll be sharing here on the blog, so if you’ll have to grab a copy of the book if you want the rest of the recipes from it. If you’re planning to buy it, do me a huge favor and pre-order it? Apparently, that’s a huge deal in Amazon-world. Pre-orders get more weight in their search algorithm than copies sold after the release date or something like that. I don’t know, but I really want this book to do well so I can write another one. It can’t hurt – plus if you preorder, you’ll get it in your mailbox on the day it releases so you won’t have to wait an extra second. You all know I love a good sheet pan meal, so this book is full of them. This sheet pan barbecue chicken dinner recipe is one of my favorites. Funnily, it’s probably one of those more complicated recipes in the book, even though it’s seriously easy to make. What’s so complicated about it? Well, besides a sheet pan, you’ll also need a bowl to make the mango salad (gasp). Honestly, I usually just mix the salad right on one of my dinner plates. It’s a useful little hack that saves me from having to wash an extra dish. Have I ever mentioned how much I hate doing dishes? There’s a recipe for homemade barbecue sauce in the book, but store-bought sauce is totally fine. That’s what I used when I made this last week. Barbecue chicken is a summertime classic, but now you can enjoy it year-round thanks to this easy sheet pan recipe. 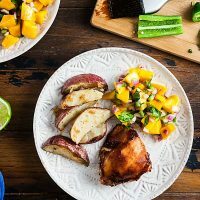 Instead of a vegetable, like corn or green beans, I like serving this chicken with spicy mango salad to keep the summertime theme going. If you have extra barbecue sauce, use it on your crispy potato wedges. Arrange the potato wedges in a single layer on one side of a sheet pan. Drizzle with olive oil and season with salt and pepper. Place the chicken thighs on the other side of the sheet pan. Brush the chicken with barbecue sauce. Bake for 25 to 35 minutes until the chicken is cooked through and !the potatoes are soft. While the chicken cooks, in a medium bowl, stir together the mango, jalapeño, red onion, cilantro, lime juice, and a pinch of salt. Mix well. Let stand at room temperature for 5 minutes.